Imagine an important turning point in your life. Now imagine you had a way of reliving that time, but a little bit differently. How would things pan out? Would everything work out better than before or much, much worse? How many other factors can come in to play when one little thing changes? This is the premise behind “Stories: The Path of Destinies”. 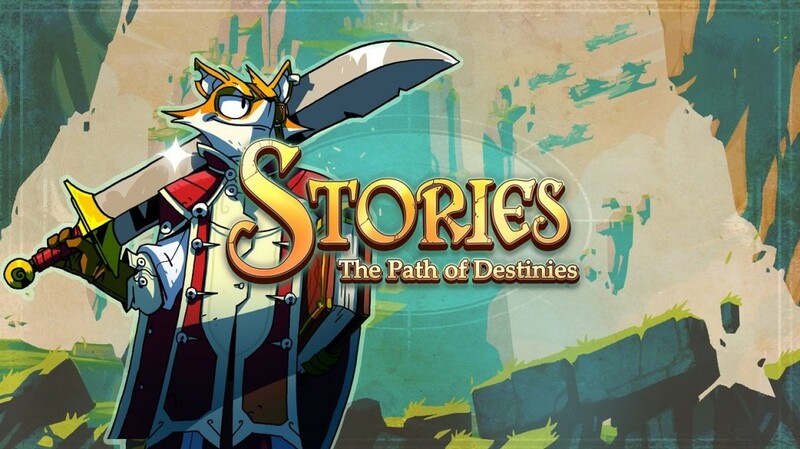 In “Stories: The Path of Destinies” the Emperor of the world has been corrupted by some unknown force and is hell-bent on sacrificing masses of the populous for a dark purpose that the protagonist Sky Pirate Reynardo has yet to find out about. Reynardo is not a hero by any means and doesn’t know a lot of things but what he does know, however, is that there are those who are fighting against the Emperor, the Rebels, and they are making their final stand very soon. He also knows that the insurmountable odds against the rebels will end in their deaths. The Rebels needed a gamechanger and, by chance, Reynardo happens to stumble across it, a mystical book that seems to force him to live over the last few days of his life to see where he went wrong and how to make things right in the world. It’s a huge task and he certainly doesn’t know where to start so it’s up to you to make all the hard choices and have him stumble through these trying times and help him become the hero he’s always wanted to be. At the beginning of the game, you are equally clueless as Reynardo. The goings on of the main story are purposely vague as the game is all about fighting your way through the Emperor’s seemingly endless Raven army to the truth and eventually finding the means of thwarting his plans once and for all. As you play through the game you will encounter a number of hard choices that will shape your playthrough of the story. Each will provide you with a various endings to the tale (normally a grisly end to Reynardo’s life) at varying parts of the game depending on how terribly bad a choice you made. Though it will come to a time however that your failures will reveal a “truth”, a vital fact about the goings on of the story. These truths you uncover will have the potential of changing everything and bring you a step closer to the game’s final ending and fulfilling Reynardo’s true destiny. There’s a lot of fighting involved in each playthrough of the game but it is enjoyable and fast-paced and plays sort of like “Arkham City” or “Shadows of Mordor”. Combat is snappy and responsive and based upon building up combos while parrying enemy attacks and dodging enemy magic. It doesn’t take very long to become accustomed to the play style and while the game does include some RPG elements such as allowing you to level up, learn new techniques and craft stronger weapons all these things only serve to make the combat that little bit too easy. There is a sweet spot during early playthroughs of the game where you are just about strong enough to take on enemies efficiently but the variation and strength of enemies is still enough to provide a good challenge but it is only a matter of time before you out-level these challenges and fighting soon becomes a trivial matter and, in truth, a little bit tedious. As such, the main draw of the game comes from discovering the various outcomes of your choices and implementing your knowledge of the story into future choices to try and avoid what went wrong the first time round. 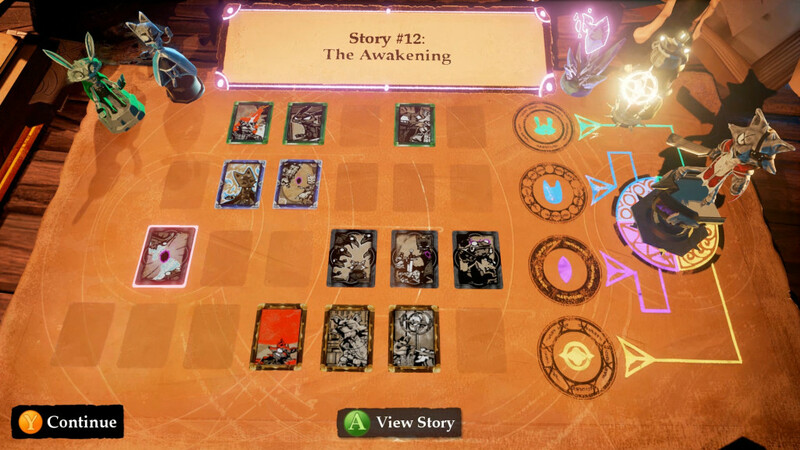 Each variation of choices and their conclusion is logged in the form of a card in Reyardo’s book for you to review at your leisure. Discovering a “truth” about the story is always very exciting though as they tend to open new areas of the game with new puzzles, beautiful environments and even more choices to make. Stories is a joy to play as it has a fantastic narration and talented voice acting from Julian Casey who does excellent work changing his voice for multiple characters. It also has a great art style and wonderful soundtrack that really lends to the whole games fantasy feel. The story’s characters are well fleshed out and each playthrough gives you a little bit more insight into Reynardo and his history with each of the characters you encounter. By the time the game is “complete” you’ll find yourself wanting to go back and unlock all the outcomes you had missed. Stories: The Path of Destinies is a gem of a game and we were happy to be given the chance to review it by the publishers and can’t recommend it enough. Final Fantasy IX arrives on SteamTotal War: Warhammer looks EPIC!